For the last couple years FNH USA has been enjoying great success with its "3-Gun Nation" series of sponsored matches. Its FNP-45 Competition model, while aimed at the competition market, is much more than a "game" gun. The FNP-45 is a 4.5-inch barreled .45 ACP with a blackened stainless slide as wide as the frame, which is engineered to accept a fat double-column magazine. It's a big gun, not something you'd be able to conceal under anything less than a winter coat, but it would a perfect duty gun for law enforcement or a bedside table gun with a light clamped onto it. And, of course, it works very well for the handgun portions of 3-Gun matches in those divisions where 9mm just doesn't cut it. which is just about what an all-steel 1911 Government model with a light rail weighs empty. 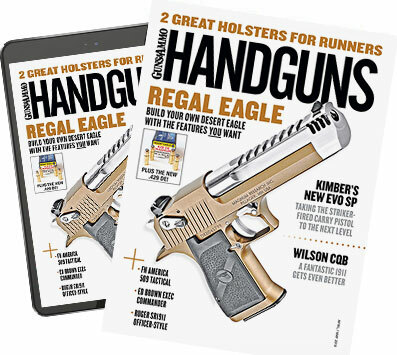 The pistol weighs 29.9 ounces empty—only a few ounces more than the .45 ACP Glock 21 but with so many more features. The FNP-45 Competition is a double-action/single-action auto with a three-position safety/decocker lever and an external hammer. It can be carried cocked and locked with the safety up. Push the safety down, and you're ready to fire. Push it all the way down, and the hammer decocks. I don't care for pistols whose decocking safeties look and operate similarly to the thumb safety on a 1911, as I shoot 1911s with my thumb on top of the safety and tend to decock such autos accidentally while shooting. I didn't have that problem with the FNP-45 Competition. I found I could ride the safety because the lever has to be depressed so far down to decock it I couldn't do it by accident. The rear sight is serrated, with a U-shaped notch. The front sight is a post fitted with a red fiber-optic rod insert. Fiber-optic front sights have seen increasing popularity in competition shooting in the last 10 years, and for good reason. They're colored in any light and in direct sunlight glow like they're battery powered. Not only are they easy for ailing eyes to see, they allow you to track the front sight in your peripheral vision during the entire recoil cycle and get back on target quicker. The FNP's sturdy fiber optic is supported at the front, back and in the middle, while still leaving enough of the rod exposed to the light to ensure a bright dot even on cloudy days. The FNP-45 also has a metal plate just forward of the rear sight on the top of the slide is a metal plate secured with Allen screws. Take it off, and you can mount a mini-red dot sight on the slide. The pistol comes with different adapter plates to fit either Trijicon- or Docter-type sights. How cool is that? The 10-pound double-action trigger pull on the FNP-45 Competition was smooth and neither too long nor heavy, and while the single-action trigger had a lot of takeup, it broke at just 3.5 pounds. The trigger itself was polymer, with a smooth face. This pistol has a big, rectangular frame but is supplied with four different backstraps to tailor the grip to your hand as much as possible. There are two flat backstraps and two arched, and you have your choice of checkered or horizontally serrated in each size. The arched ones don't increase the distance to the trigger. Even with the flat backstrap in place, this is not a small grip, but I was still able to reach the trigger in double action with my medium-size hands. The frame is very aggressively textured, and it will not move in your hand. The FNP-45 Competition has a ramped barrel and a full-length recoil spring guide rod. The base pads for the magazines are rounded and quite prominent, but I can't fault that on a gun aimed at competition that started out big anyway. It ate everything I fed it, and was more than accurate for competition or the street. If you're looking for a new 3-Gun competition pistol, or have a niche which the FNP-45 Competition fills, give it a look. Smallest avg. group: 230-gr. Black Hills JHP—2.5 in. Largest avg. group: 230-gr. Remington UMC—2.9 in. Avg. of all ammo tested (4 types)—2.7 in.